Heather-Marie Merrill and Tammy Burns from Sacred Heart Parish in York use a break time at the conference to look at websites. Several speakers told about 60 parish leaders how they could take home to their parishes some methods for digital communications during an all-day event Saturday, Oct. 18 at St. Joseph’s University. 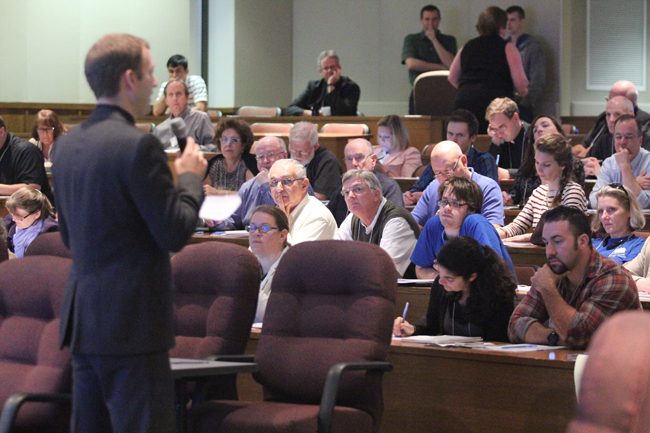 Matthew Warner, founder and CEO of Flocknote, which allows churches and ministries to connect via group emails and text messages, said the seminar helped support the New Evangelization. He said the event’s speakers sought to promote technology, introduce the power and opportunity behind it and connect it to the mission of the church. “Communication should lead to communion,” Warner said. Updating parishes to use new technology is a challenge, he noted, because they are slow to change in this area. A new way to promote the church and its ministries is necessary. Warner said the communication methods of the past are no longer functional, and the church must adapt to promote its parishes and ministries. 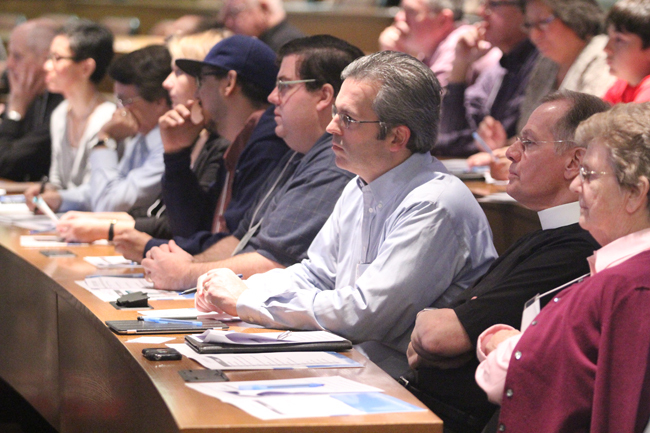 The Digital Church Conference, sponsored by the John Cardinal Foley Chair of Homiletics and Social Communications at St. Charles Borromeo Seminary, emphasized the importance of creating and developing parish websites as well as promoting them to reach a larger demographic. 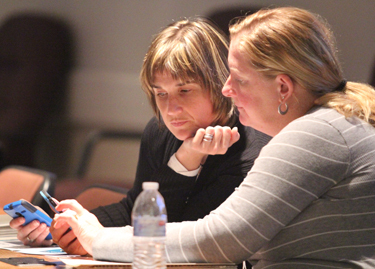 Parish staffers and in some cases their pastors and other clergy and religious learned diverse ways, including practical tools, to increase the use of already existing websites. Josh Simmons, founder and CEO of eCatholic — a website management system provider for parishes, schools and dioceses — stressed the need for appealing website designs. The appearance and content on a site convey a parish’s message. 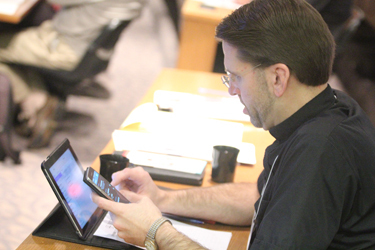 Transitional Deacon Joseph Zaleski uses mobile technology — including his smartphone and tablet computer — during the conference. Simmons said most people go to a parish website before visiting its church or school, so a visitor’s first impression comes from a parish’s web presence. Brandon Vogt, author of the book, “The Church and New Media,” said the conference wanted to convince Catholics of the powerful tools at their disposal. These tools, including Facebook, Twiiter, blogs and websites, help evangelize and communicate the person of Jesus to viewers in an efficient and expedient manner and assist parishes in achieving their goals. The John Cardinal Foley Chair of Homiletics and Social Communications at Saint Charles Borromeo Seminary hosted the event. Father Thomas Dailey, O.S.F.S., the John Cardinal Foley Chair at the seminary, talked about the great turnout at the university’s Mandeville Hall and the diverse organizations present. Father Dailey spoke on a similar topic, “New Media, New Mission: Evangelizing through Social Communications,” in May as a part of the Adult Faith Formation Spring Workshop at St. Thomas of Villanova Parish in Rosemont. Matthew Warner, CEO of Flocknote, said the communication methods of the past are no longer functional, and the church must adapt to promote its parishes and ministries.